Photo collages are a fun way you can share some of the most important moments of your life with others, and create beautiful pieces of art to hang on a wall. With an Android smartphone and the right app, you can make stunning collages in a matter of minutes, if not less. You just need some photos that you’ve already taken, and then a collage maker can stitch them together in a collage. Some collage makers even allow you to take photos right within the app. Instagram itself doesn’t have a built-in way for you to make collages out of its photo; however, it does have a separate app that you can install aptly called Layout. Layout lets you create one-of-a-kind layouts by using and manipulating your own photos. Then, when your collage is made, you can directly share them with all of your Instagram followers. One of the neat things about Layout is that you can use it to not only use photos from your gallery, but to take shots with, too. Gallery lets you choose photos from your phone’s album, and Photo Booth allows you to take those spur-of-the-moment shots. Either way, you can instantly see your Layout, and then choose to edit it, make it your own, and publish to your Instagram feed! 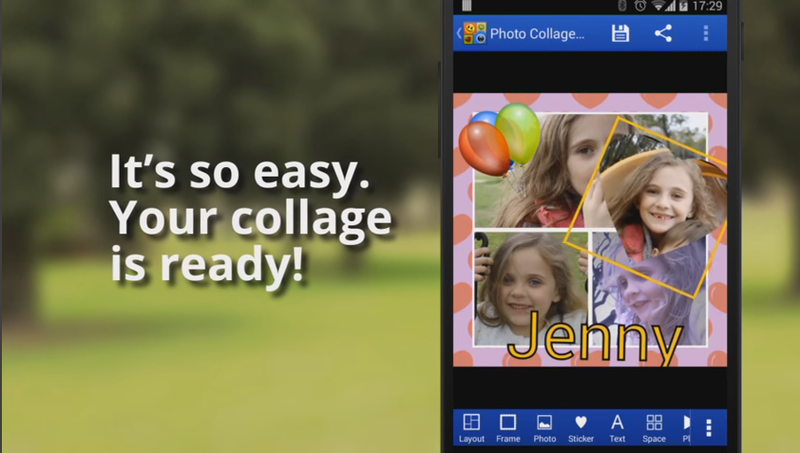 Next up, we have Photo Editor Collage Pro. If you’re looking for a go-to app with all sorts of collage making abilities, you cannot go wrong with what this one has to offer. This one will allow you to edit photos, make your collage, and then add all sorts of edits to your collage to make it, well, perfect. Photo Editor Collage Pro gives you a selection of dozens of filters, grids, backgrounds, stickers, fonts, and so much more. The best part of Photo Editor Collage Pro? The massive suite of tools that it has for you to use is all free of charge — you don’t have to pay for a subscription to use. 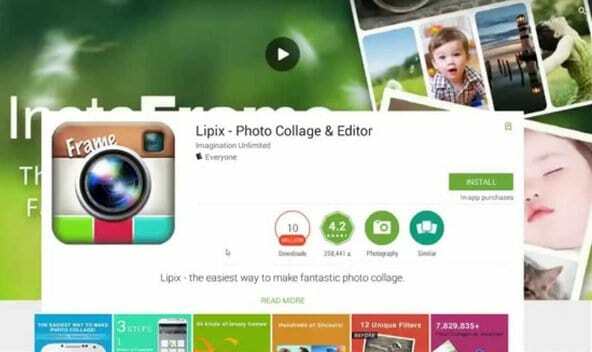 Previously known as InstaFrame, Lipix is a popular collage-making app for Android with easy-to-use presets for just about any occasion, such as holidays, birthdays, Christmas, and others. Included in the app are 90 adjustable templates with 5 supported ratios: 1:1, 3:2, 2:3, 4:3, 2:1. Each template can be further customized by changing its border or by applying any of the 12 magical effects, which change the overall look of the collage. The app’s workflow is very simple. You simply select a layout, fill it with your pictures and photos, adjust their sizes, position, and style, and then proceed to add words, emojis, and stickers to make the collage truly yours. Lipix allows you to put text to your photos, change its color, sizes, and font. Once you are happy with your creation, you can share it with your friends and family members via Facebook, Twitter, Flickr, or virtually any other Android app that supports the contextual sharing functionality. Lipix is available in Arabic, Turkish, Russian, Hindi, Spanish, German, Italian, French, Japanese, and Korean; and the developers work tirelessly to enhance the app with new features and bug fixes. Even though Lipix is the least popular app on this list, it deserves as much attention as the rest. MOLDIV by JellyBus is a feature-packed suite of photo apps designed to take you from the start to the final photo collage. Depending on what kind of photo you want to take, you can choose either the Beauty Camera or the Pro Camera. The former helps you take perfect selfies every time by smoothening your skin, and the latter opens doors to endless creative expressions with fun filters. The next step is to collage your photos with the help of 100 magazine-style layouts, 180 frames, and the ability to combine up to 9 pictures in a single frame. You can adjust the aspect ratio of the collage however you want and take it to the next level with an assortment of design tools. The built-in text function packs more than 100 creative fonts. And like that wasn’t enough, there are 560 stickers and 80 background patterns to choose from. 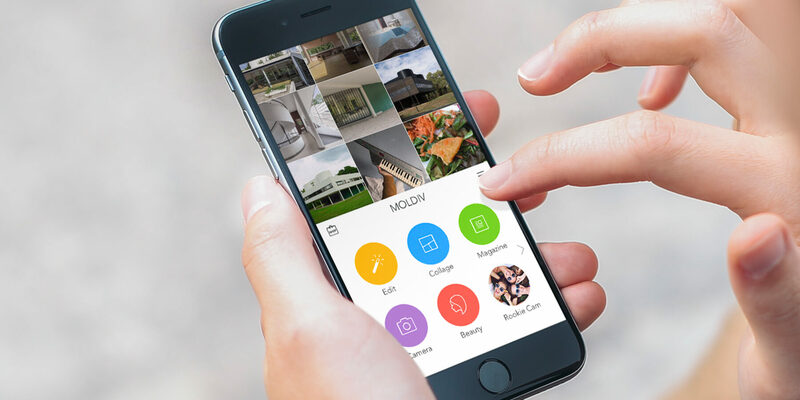 Needless to say that MOLDIV supports both local saving and social sharing to Instagram, Snapchat, Facebook, and all other popular social media networks. Unlike Lipix, which can run on any Android 2.3 or higher device, MOLDIV requires Android 4.0 and up to function. Build to accomplish only one thing and accomplish it exceptionally well, Photo Collage Maker from Scoompa, nails down the customization aspect of photo collages without overwhelming users with unnecessary features or complicated user interface. The app contains more than 100 predefined photo collage layouts, and it even allows users to create their own. All photo collages created within the app can be decorated with a variety of stickers, background patterns, filters, and text. You are free to select from over 55 different fonts, change the text size, color, style, and more. Best of all, the app is controlled by easy-to-remember touch gestures that make the editing process highly enjoyable. With Photo Collage Maker, you can save your finished collage as high-resolution pictures, which makes it possible to later print them and display in your home. The app is available for free for all Android 3.0 and higher devices. Photo Collage Maker is currently in version 12.1, which goes to show how active the developers are. Pic Collage from Cardinal Blue Software is a true powerhouse when it comes to creating stunning photo collages. One of the things that have made the app so popular is the always increasing library of fonts, stickers, seasonal backgrounds, borders, and effects. Users can import photos and pictures from social media sites, the web, or the local storage. Using the modern user interface, it takes just a few taps and intuitive gestures to place the pictures on a variety of available collage grids, add text, throw in some effects, and share the result with others on Instagram, Facebook, Twitter, and other sites. One special feature that makes the Pic Collage stand out from the rest is the ability to edit photos using Aviary, a popular photo editor, by just double-tapping on them. Another great feature is the ability to search for collages created by other users of the app and use them as a basis for your own creations. Others can then vote on which collage looks the best and the most popular entries can win great prizes from Pic Collage’s sponsors. Photo Grid, the most popular collage app for Android, radiates creativity and user-friendliness. It empowers users to turn their ordinary pictures into stunning photo collages in a matter of minutes, all while having a lot of fun while doing it. Think of the app as a more creative version of Instagram. Just like on Instagram, you can take great-looking selfies, edit how they look using filters, and more. But only with Photo Grid you can also decorate the pictures with stickers, text, borders, or drawings. Most importantly, you can turn the edited or natural images into scrapbooks filled with memorable moments of your life. A special feature not found in any other photo collage app on this list is the ability to turn ordinary photos into stunning video stories. It’s called Video Slides and it works on any Android devices running Android version 3.0 and up. When you are satisfied with the results, you can export your collage as a high-resolution image or video file, depending on the nature of the collage. If you don’t have time to try any other apps on this list, this is the one to get. After all, there’s a good reason why Photo Grid has received 5 stars from well over 4 million users. As you can see, there are a lot of excellent photo collage makers for Android. Any one of these will help you craft and stitch together your favorite photos. Any one of these seven applications will help you accomplish your goals; however, we do think that Layout by Instagram has some of the best abilities for bringing you a high-end collage that you can share with your friends. Do you have a favorite photo collage app that you use for Android? Let us know in the comments section below, and your suggestion might end up on our countdown at some point. Thank you for sharing. But i love making photo collage on pc with amoyshare photo collage online.